Apple has introduced Apple Watch Series 3 at an event. It comes with built-in cellular connectivity that will let you make and receive calls, messages and more. The new Apple Watch is powered by a dual core processor that offers 70% more performance. Siri has also become smarter and will also talk. It comes with a W2 wireless chip that results into 85% faster WiFi performance. Apple Watch will share the same phone number as your existing iPhone and will sport an electronic SIM as supposed to a traditional nano SIM. 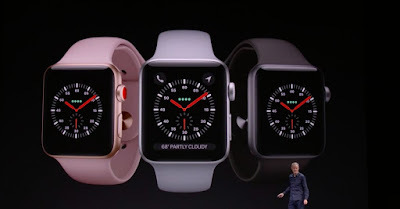 Apple Watch comes in several cases and bands. Pre-orders will start September 15 and it will be available starting September 22nd.Apple Watch Series 3 is priced at $329 for WiFi and $399 for Cellular.